René Descartes (31 March 1596 – 11 February 1650) was a French philosopher famous for his work on metaphysics, particularly his work Meditations on First Philosophy. In Meditations on First Philosophy, Descartes proposed various arguments for the existence of God. They are lesser known arguments because they build upon Descartes' philosophy, which was not generally popular among later apologists. Multiple arguments were formulated by Descartes and were not clearly separated or named. My clear and definite conception of God implies that he necessarily exists. Any clear conception of an idea and its parts must be true. Another argument is the preservation argument or the conservation of existence argument, which is a variant for the first cause argument. Something other than me causes the continuation of my existence (since I did not create myself from nothing). The cause must be a thinking being because the cause cannot be lesser than the effect. Any cause that is not divine lacks the attributes necessary for its own preservation. There cannot be an infinite regress of causes. "But perhaps the being upon whom I am dependent is not God, and I have been produced either by my parents, or by some causes less perfect than Deity. This cannot be: for, as I before said, it is perfectly evident that there must at least be as much reality in the cause as in its effect; and accordingly, since I am a thinking thing and possess in myself an idea of God, whatever in the end be the cause of my existence, it must of necessity be admitted that it is likewise a thinking being, and that it possesses in itself the idea and all the perfections I attribute to Deity. " "But if the mere fact that I can produce from my thought the idea of something entails that everything which I clearly and distinctly perceive to belong to that thing really does belong to it, is not this a possible basis for another argument to prove the existence of God? Certainly, the idea of God, or a supremely perfect being, is one that I find within me just as surely as the idea of any shape or number. And my understanding that it belongs to his nature that he always exists is no less clear and distinct than is the case when I prove of any shape or number that some property belongs to its nature"
My conception of God includes existence since this is more perfect than non-existence. I cannot conceive of God not existing. Among a series of skeptical arguments, Descartes raised the possibility of our senses being mislead by a powerful entity, known as the evil demon or the evil genius. The world we perceive, the sensations of our bodies and the existence of other minds could be a manufactured illusion. The idea differs from the concept of Plato's cave, in which the apparent world has an indirect reflection of the true world. 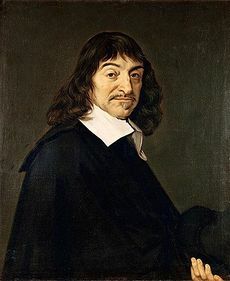 Descartes says it is possible that the reality we perceive may have no connection with the external world. It is also similar to the concept of a brain in a vat. "I will suppose therefore that not God, who is supremely good and the source of truth, but rather some malicious demon of the utmost power and cunning has employed all his energies in order to deceive me. I shall think that the sky, the air, the earth, colours, shapes, sounds and all external things are merely the delusions of dreams which he has devised to ensnare my judgement." In some versions of the evil demon, it can also mislead our thought processes and is omnipotent. "in order to remove even this slight reason for doubt, as soon as the opportunity arises I must examine whether there is a God, and, if there is, whether he can be a deceiver"
We must assume God exist for us to rely on our clear and distinct perceptions to determine what is true. We must assume we can rely on our rely on our clear and distinct perceptions to know that God exists. There are further arguments and counter-arguments to this as well. Descartes denies that God must be the guarantor of our trust of clear and distinct perceptions because they are supposedly self evident, but he seemed inconsistent on this point. This page was last modified on 1 April 2019, at 15:08.